2015 Aprilia Dorsoduro 1200. Picture credits - Aprilia. Submit more pictures. Featuring an array of technical and aesthetic enhancements, the Dorsoduro 1200 has no equal in terms of class leading performance in the maxi motard segment. Boasting an amazing 130hp and placed in an incredibly agile and lightweight chassis. Front brakes: Double disc. Bremo. ABS. Rear brakes: Single disc. Bremo. ABS. Comments: Two channel Continental ABS with Aprilia Traction Control. Integrated engine management system. Triple map Ride by Wire throttle management: Sport (S), Touring (T), Rain (R). Sold in Australia. Ask questions Join the 15 Aprilia Dorsoduro 1200 discussion group or the general Aprilia discussion group. Bikez.com has a discussion group for every motorcycle. Here you may find answers to common questions about the model. If you do not find what you are looking for, you can ask questions. 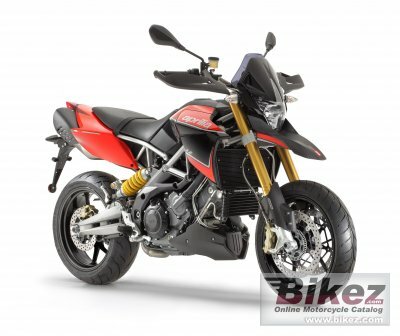 Try out the 2015 Aprilia Dorsoduro 1200 discussion forum. You can sign up for e-mail notifications when other users answer you. If you have information about any technical issue related to this motorcycle, please leave a comment for other riders.